Last week, the blogosphere had something in common with the mainstream media. As the health care bill moved toward House passage, both devoted unprecedented levels of attention to the issue. The difference was that while the traditional press was focused largely on political strategy and counting votes, bloggers sounded off about the bill itself and the legislative process. From March 15-19, fully 56% of the week’s links in the blogosphere were about the health care issue, according to the New Media Index from the Pew Research Center’s Project for Excellence in Journalism. That was five times bigger than the next story and the highest level of interest in the subject since PEJ began tracking social media in January 2009. In addition, it represents the most attention bloggers have paid to any topic since June 15-19, 2009, when the post-election protests in Iran made up 63% of the week’s links. Throughout the course of the week, bloggers highlighted a number of aspects of the reform debate, many of which originated from opinion pieces first appearing in the Washington Post. These included a column by the former editor of the New York Times criticizing coverage by Fox News, a warning from Democratic pollsters about the dangers of ignoring public opposition, and a column from a Republican House member suggesting a different path for health reform. Opponents of reform dominated the discussion as they criticized the process used to pass the bill and asserted that Democrats would suffer at the polls for ignoring public opinion. But what really characterized the debate was the passion of the opponents, who frequently characterized the bill as subverting of the public’s will. Indeed, supporters of the health care legislation were substantially outnumbered in the blogosphere last week. 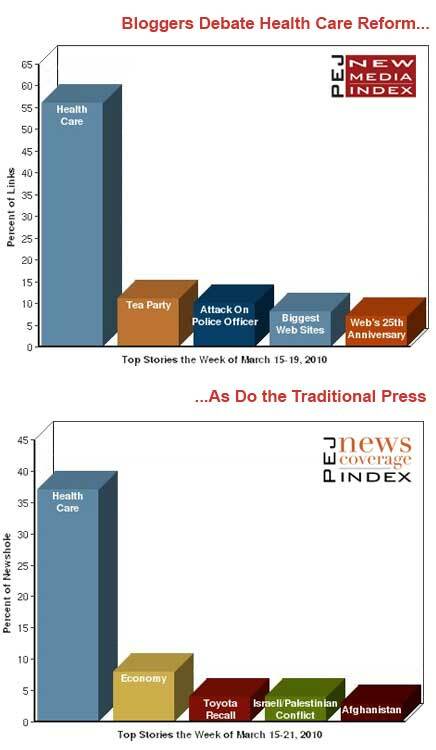 The health care issue also dominated the mainstream media, filling 37% of the newshole according to PEJ’s News Coverage Index. Some of that coverage was passionate and ideological as the radio and cable talks shows devoted 80% of the airtime studied to the subject. But much of the mainstream coverage also involved tactics, the horse trading and nose counting in the run-up to the vote. The second story on blogs, with 11% of the links, was another political story. Bloggers linked to a Los Angeles Times article about Virginia Thomas, the wife of Supreme Court Justice Clarence Thomas, who launched a conservative Tea Party group. Bloggers were split along ideological lines about whether Thomas was creating a conflict of interest for the Court or was just a concerned citizen exercising her First Amendment rights. The next most linked-to story was news of the weird: A crime story about a man in Britain who assaulted a female police officer with his genitalia (third at 10%). That was followed by two internet-focused stories. A BBC interactive graphic showing the 100 largest Web sites on the net according to Nielsen data was fourth at 8%. And a story about the 25th anniversary of the date that the first dotcom name was registered was fifth at 7%. 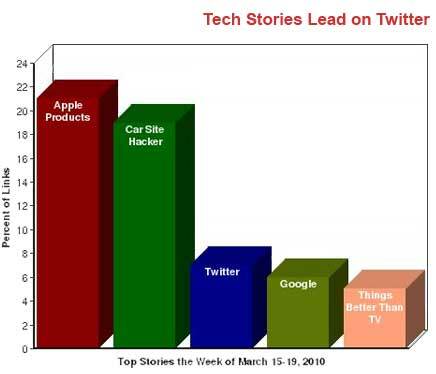 On Twitter, all the top stories last week were technology-related. Stories about Apple products were first with 21% of the week’s links. They included a Mashable report about the iPad’s battery replacement plan and an investigative report by Wired about some Web sites that review iPhone applications and are requesting payment from developers in exchange for product write-ups. A story about a hacker in Austin, Texas, who broke into a web-based vehicle-immobilization system to either disable cars or tinker with their horns, was second at 19%. The announcement of a new function known as "@Anywhere" on Twitter was third at 7%. Twitter CEO Evan Williams declared the new function would make it easier for partner sites to utilize Twitter links and data. And a blog entry by author Seth Godin that lists a number of tasks that are better than watching television was fifth at 5%. The critical week for the health care debate began with bloggers responding to a March 12 Washington Post column by two Democratic pollsters, Patrick H. Caddell and Douglas E. Schoen. The piece warned Democrats that if they ignored polls regarding opposition to health care reform, they would face large losses in the upcoming midterm elections. Most of the bloggers who linked to the piece agreed with the pollsters. "It seems interesting that the Dems are so incredibly tone-deaf with regards to the will of the people on health care. Poll after poll shows Americans don’t like this bill," agreed The Fed Up American. "Yes we all think health care needs some changes. But most of us think those changes should include LESS government involvement…not more!" Some of the focus shifted after a March 14 column by Howell Raines, former executive editor of the New York Times, in the Washington Post where he asked why "honest" journalists have not criticized Fox News cable for conducting a "propaganda campaign" against Obama and health care reform. Some bloggers backed Raines’ point of view. "Finally, someone in the mainstream media has evaluated in a public forum the truth about Fox News Network," wrote Lee Durham Stone at Embodied Space. "Fox’s overall modus operandi is not journalism-requiring verification-but at best editorialization and at worst propagandizing. Fox is what it is-a political campaign." However, a number of conservatives questioned Raines’ credibility, noting that he left the Times under the cloud of the scandal triggered by revelations that reporter Jayson Blair had plagiarized and fabricated stories in the paper. "It sounds like something straight out of The Onion: A critique of FOX News by one of the most biased, least open-minded individuals ever to sully the profession of journalism, Howell Raines," declared Howard Portnoy at Hot Air. "If the name is unfamiliar, Raines…is a former executive editor at the New York Times, another bastion of journalistic fairness and honesty. His most notable achievement at this newspaper was hiring professional liar and plagiarist Jayson Blair." On March 15, Republican Representative Paul Ryan of Wisconsin published a piece in the Washington Post criticizing the President’s plans and laying out his ideas for reform. Most of those who linked to Ryan’s piece thought he was offering a better alternative. "He [Ryan] goes on to offer suggestions on what real reform would look like. It is reform that Democrats can’t believe in because it rejects their control freak model and replaces with market based solutions that give patients more choice and more freedom. Democrats are against both choice and freedom," criticized Merv at Prairie Pundit. "It’s too bad that the White House didn’t spend more time working with people like Paul Ryan on how to responsibly reform health care," decided Pejman Yousefzadeh at the New Ledger. "Instead, it spent time demonizing him for putting out a fiscal roadmap and for trying to offer alternative ideas on health care." Conservatives roundly criticized the possibility. "Any pretense of democratic accountability has just gone out the window with ‘deem and pass,’" wrote Dean at Beers with Demo. "After all, it would be just too much to ask our elected representatives to do what the hell it was we sent them to Washington to do." "If the bill is so wonderful and does so many great things then why do they need cover?" asked Big Dog’s Weblog. "If this is the panacea that will solve our health care problems then why are they not proudly standing up and voting for it? They are not voting for it because they know it is a crap sandwich that Obama wants them all to take a bite from." On March 17, bloggers highlighted the transcript posted by Fox News of a contentious interview of Obama conducted by Bret Baier. While a few bloggers felt Baier had been overly combative with the President, many lauded the host for how he handled the interview. "If you haven’t seen the Bret Baier interview of President Obama then what are you waiting for?" proclaimed Curt at Flopping Aces. "It was one of the best interviews of this narcissistic man by the media in ages. Finally a reporter who isn’t starry eyed nor weak willed. Baier noticed quite early that Obama was attempting to filibuster the interview and wouldn’t have it, while still appearing polite and non-threatening." Others were outraged about Obama’s comment during the interview that he did not spend much time on the procedural rules of the House or the Senate. "The president isn’t concerned about other branches of government following the Constitution?" wondered Papa Mike’s Blog. "It’s not like he’s sworn an oath to preserve, protect, or defend the Constitution or anything." On March 14, the Los Angeles Times profiled Virginia Thomas, the wife of Supreme Court Justice Clarence Thomas, and her role in founding a conservative activist Tea Party group called Liberty Central Inc.
Quite predictably, the views expressed online split along ideological lines. Conservatives who support the Tea Party movement applauded Thomas’ participation. "Virginia Thomas, wife of Supreme Court Justice Clarence Thomas, is becoming heavily involved with the Tea Party movement because she wants to help rescue our country!" wrote Republic Heritage. "I’m thrilled she cares enough to do it! Of course, the press and others are giving her grief about it. Typical." "Are we seriously still not getting the 1st Amendment and what it means for all Americans?" asked American Soldiers Wife. "Ginni’s actions and thoughts are her own. While I understand what one spouse does can have a reflection on how others see the other spouse; still, I do not understand how in the twenty-first century people are actually trying to strip away someone’s rights of freedom of expression and free speech." Liberals saw the issue quite differently, especially in light of recent Supreme Court rulings. "So the Supremes rule that corporations are just like people and can give campaign money unfettered," noted Prairie Sun Rising. "And the wife of a Supreme starts up her very own Tea Party group which can rake in the big $$$$$. Just affirms again…. It’s not about the ideology. It’s the profiteering and power, ba-bee….."
"If Judge Thomas wished to be more supportive of his wife’s endeavors, he could simply resign from the bench," suggested Michael Kieschnick, president of CREDO Mobile, on the Huffington Post. "It would be fascinating to see what level of support Liberty Central would then enjoy. One suspects little." The most viewed news video on YouTube last week, entirely in Hungarian, was a short movie by filmmaker Gery Greyhound about Hungarian politics. The second most-viewed news video featured an American public official who is no stranger to controversy. Former Minnesota Governor and professional wrestler Jesse Ventura appeared on the March 10 edition of The View where he discussed his new book on American conspiracies regarding major historical incidents such as the assassination of President John F. Kennedy and the attacks of September 11. This is not the first time an interview with Ventura made the list of most viewed videos. In May 2009, two separate interviews with Ventura, one with Fox News host Sean Hannity and another on The View, both made the list that week.